It's been so long since last time I updated this project. Back then there was hardly reliable Windows 8 patches. Since I started to apply UxStyle memory patching in previous release, I planned to make complete memory patching build in next version so all Windows since XP can use this without trouble and now I can do this after releasing OS X Mavericks updates with Windows 8.1 support. Unfortunately, back then UxStyle supports only Windows 8 x64 so I decided to wait until it supports x86 platform. You maybe curious why I have to wait for UxStyle so let me tell you this. It's the best memory patching approach with Microsoft certificates. And I'd like to make it simpler to use like this program that you just run it and click 'Patch' then done. It took this long to reach this milestone but it's finally here now having both 8/8.1 and x86/x64 support without single file patch anymore. 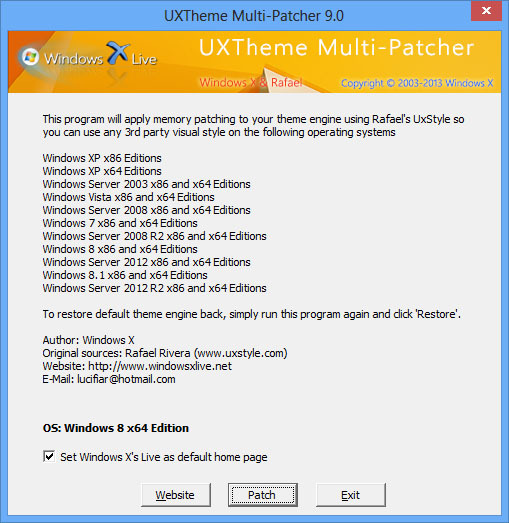 I've been using Rafael's UxStyle memory patch since long. It works flawlessly!